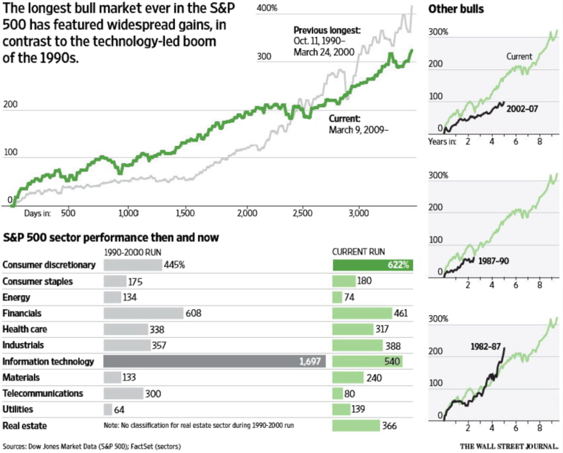 We are officially in the midst of the longest bull market ever for the S&P 500 (by one measure). Before you start running for the exit, remember, bull markets don't die of old age, they die of excesses. Right now, we are not seeing overindulgence like we experienced leading up to past recessions. It is also worth pointing out that even though this may be the longest bull market, it is not the largest in gains, thus far. What have we learned from prior expansions? One lesson I have learned is that it pays to be a contrarian, but only some of the time.... Is this that time? These calls are tough to predict and the analysts bold enough to predict such a time only to find out they are wrong, may have trouble finding a job on Wall Street. For this reason, it is often easier for these analysts to follow the herd and stick with the momentum plays. The issue for investors is that these momentum plays often end like an episode of Game of Thrones. Look at the sector returns of the 1990-2000 bull market, where consumer discretionary, energy, financials, industrials, information technology, materials, and telecommunications sectors did not experience of drawdown (maximum loss) of at least 10% from 1991-1999. It is not surprising to see that four of the seven experienced the worst losses in 2000, with technology bearing the brunt of it. As for the other three - they may have escaped the crash in 2000, but they did not go unscathed. Energy plummeted in 2008 and again in 2014, industrials lost ~40% in 2008, and financials....well our last recession wasn't called a "financial crisis" for nothing. Today, what sectors pose the biggest risks for investors. If we use the same logic, then it would be prudent to be wary of...well...just about any sector outside of energy, financials, and materials. The problem is, these sectors have experienced significant losses in past recessions due to their cyclical nature. Now, we have a problem. So instead, I will just point out one sector that may be in danger, consumer discretionary, which has been on a tear this entire expansion and has not experienced a negative year since 2008. One reason - a stock in this sector ends in "mazon", and begins with the letter "A". But, I'm not going to give anything away. Please invest wisely and avoid following the heard. Nobel prize winning psychologist, Daniel Kahneman, says, "One of the keys to successful investing over the long run is minimizing regret." Don't chase, be pragmatic and patient. You may find the best gains will come from minimizing losses.